1. 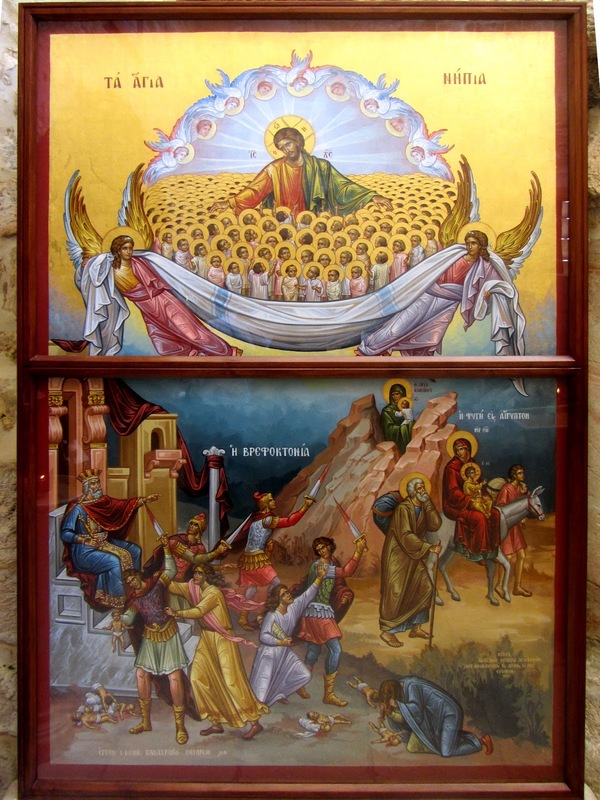 Today, dearest brethren, we are celebrating the feast of those infants who, the Gospel text tells us, were killed by King Herod, and for this reason our land, the fruitful mother of heavenly soldiers and such great virtues, should rejoice with the greatest exultation. Behold, the wicked enemy could never have helped the blessed infants as much by submission as he did by his hatred. As today's most sacred feast shows us, the grace of benediction shone forth in the blessed infants as much as cruelty against them abounded. For we heard a little while ago that when King Herod was pursuing Christ, thousands of happy boys were killed. As the prophet said, "Rachel mourns her children, she refuses to be consoled because her children are no more" (Jer. 31:15; Matt. 2:18). The blessed mother of the triumphant, the land of illustrious warriors, rich in children, for a short time seemed to the eyes of the foolish to be bereaved. But she never was in need of consolation, nor did she bewail the sons whom she acquired with enviable sorrows, even while she lost them. Blessed are you, Bethlehem, land of Judah, who suffered the cruelty of King Herod in the death of your sons, and at the same time merited to offer to God a white-clad group of peaceable, sinless infants. 2. We are celebrating in a fitting manner the feast of those children whom the world brought forth to eternal life more blessedly than birth from their mothers' womb bore them. They acquired the dignity of eternal life before they received enjoyment from the present one. The precious death of the other martyrs has merited praise in their confession of faith; the death of the infants has been pleasing in its consummation. Death itself, which put an end to their present life, afforded a beginning of glory for them at the very beginning of their life. The wickedness of Herod took them away as they were nursing at their mothers' breasts. Rightly are they called "the blossoms of martyrdom" (Prudentius, Cathemerinon 12.125), since a kind of frost of persecution along with cold unbelief consumed them in their very beginning, like the first emerging buds of the Church. For this reason it is proper to give ceremonial honor to the infants who were killed for Christ's sake, not to grieve over them; to manifest our intention in the divine mysteries and not in tears, because the one who was the source of their being hated was also the reason for their crown. The same one who was the cause of hatred is also the reason for their reward. While Herod was planning murder for the infants, Joseph was advised by an angel to take Christ the Lord into Egypt, a land full of idols. After the persecution by the Jews and the intent on the part of a wicked people to kill Christ, Christ Himself deigns to cross over to the gentiles, who were given over to idols. Leaving Judea, He is carried to a world which did not know Him, to be worshiped. 3. Because in Sacred Scripture, dearest brethren, we know that good and just men have always suffered persecution from the wicked, if we notice carefully, we will discover that those who perpetrate it suffer greater punishments than those who seem to suffer it. For every man who persecutes another in his body is recognized as first suffering persecution in his own heart. If he takes something of the wealth of the man whom he is persecuting, he causes a still greater loss to himself, because no one secures an unjust gain without a just loss. Where there is gain, there is also a loss: a gain in the money-coffers, but loss in one's conscience. When a man takes another's clothing he loses his honesty; if he acquires money, he loses his sense of justice. Men, however, do this because they refuse to pay attention to the last day. If they were willing to think continually about the day of their own death, they would keep their minds away from every wanton lust or wickedness. But because they are unwilling to think about this in a salutary manner now, afterwards they will have to suffer without any remedy. For the last day will come for them, Judgment Day, when it will not be possible for them to repent or save themselves from eternal death by good works. The sinner is tormented even by this punishment, that when he is dying God will not be mindful of him, since while he was alive he forgot about God. The day of judgment will come, on which the foundations of the mountains will be moved, and the earth "shall burn to the depths of the netherworld" (Deut. 32:22); when the "heavens will be destroyed in flames" (2 Pet. 3:12); when "the sun will be darkened, the moon will not shed her light, the stars will fall from the sky" (Matt. 24:29); when sinners and all wicked men will be hurled "into the pool of fire, and the smoke of their torments shall rise forever and ever" (Rev. 14:11); "wailing will be heard there, and the grinding of teeth" (Matt. 8:12). The time will come, dearest brethren, when no good man will fare ill, and no wicked man well. The last day will come, I repeat, when good men will be separated from the wicked, the just from the unjust, those who praise God from those who blaspheme Him. The time will come when they will all be separated in such a way that no good man, as has already been said, will fare ill, and no wicked man well. 4. Why, then, is it not so now? Perhaps it is, but what is now in secret will then be made manifest. Read Sacred Scripture; walk with me, if you can, "into the sanctuary of God" (Ps. 72(73):17), perhaps there, if I can, I will teach you. Or rather learn with me from Him who taught me that even now there is no good for the wicked, and that things are better for the good than for the wicked, even though the full enjoyment of good things has not come yet, just as the final punishment of the wicked has not come. If you carefully heed the law of God, perhaps you understand with me that nothing is well for the wicked. I beseech you, and I ask you: Why are things not well for you? You are likely to reply: Poverty chokes me, trouble pursues me, and perhaps also bodily pain and fear of my enemy. So it is bad for you because you suffer evil circumstances, and good for the man who endures himself as an evil person? There is a great difference between suffering in the midst of evil and being wicked. You are not what you suffer. You suffer evil but are not wicked yourself; that other man does not suffer evil but is wicked. Therefore do not be deceived; it cannot happen that it is not well for you who suffer evil and is good for the one who is evil. Now since he is wicked, do you think that he does not also suffer evil when he endures himself? It is bad for you because you in your body suffer evil from another; is it well for him when he suffers himself as evil within his heart? It is not good for you if you have an unproductive farm, but is it good for him when he has a bad soul? Be good, you who possess good things. Riches are good, and so is gold, silver, household, possessions - all of these things are good. What makes you good is how you act with them, not what they are. Have possessions which make you good, not those which make you evil. What are these? you say. Pass judgment and act justly. These are the good things which you possess; be good yourself in the midst of your good possessions. Blush at your possessions; do not be wicked in the midst of them, lest you perish along with them. God, the creator and regulator of all things, distributed the gift of gold and silver to men precisely in order that by nature and variety it might be good in itself. An abundance of it, however, should not lift up a man, nor a lack of it crush him. When offered, it blinds the wicked, and when it is taken away, it torments them. This comes about because when money is acquired it gives a false joy, and when it is lost it leaves real sadness. 5. Let us learn, then, to love true riches, that is, integrity and justice, peace and compassion. These are called just riches, because they are granted for good and just merits. They are also called true riches, because whoever possesses them will not want but like the Apostle is content if he has food and clothing (cf. Phil. 4:11). Therefore it is wrong to consider as riches earthly riches, which do not take away poverty, since the more a man who loves them has, the more will he burn with the bitter want of avarice. How, then, are they riches, when a want of them increases as they increase, and since they do not bring satisfaction but arouse further desires on the part of their friends, the greater they are? Do you think a man is rich when, if he owned less, he would need less? Well, therefore, someone said: "Your love of money grows as fast as the money itself" (Juvenal, Satires 14.139). The fury of desire is augmented by an increase of money, for all avaricious and covetous men seem to be sick with dropsy. Just as a man with dropsy thirsts all the more, the more he drinks, so the avaricious or covetous man runs a risk by acquiring more and is not satisfied with it when it does abound. 6. For our part, brethren, as we recall that we are "strangers and foreigners" (Heb. 11:13) in this world, let us keep for ourselves on the journey of this life only what we need for food and clothing. Let us further direct as much as we can to eternal bliss through alms for the poor. Then when on Judgment Day the covetous and avaricious, because of the barrenness of their good works, merit to hear: "Out of My sight, you condemned, into that everlasting fire" (Matt. 25:41), because of your good deeds we will be able to hear: "Come, you have My Father's blessing! Inherit the Kingdom prepared for you from the creation of the world. For I was hungry and you gave Me food, I was thirsty and you gave Me drink, I was naked and you clothed Me" (Matt. 25:24-36). To this blessedness may our Lord Himself lead us under His protection: to whom is glory forever and ever. Amen. From Sermons, Volume 3 (187–238) (The Fathers of the Church, Volume 66).